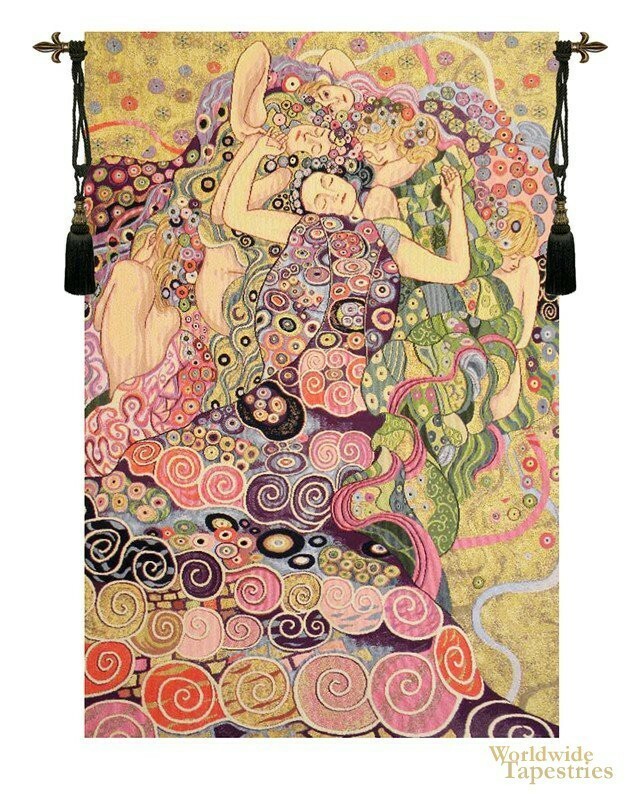 This modern tapestry "The Virgin" or "Die Jungfrau" is a work by Gustav Klimt from around 1913. Klimt was an Austrian Symbolist painter and his main subject was the female figure and characters. He was a primary figure of the Viennese succession movement, formed in 1897 by a group of Austrian artists evolving from the Association of Austrian Artists, from the Vienna Kunstlerhaus. Painters, sculptors, and architects formed this movement which represented a study of art outside tradition. Freedom to express one's artistic instinct was important to each member. Here we see the Virgin with other females in a dance of color and pattern almost bordering on a hallucinatory scene. The bold use of color and pattern by Klimt is a hallmark of his work, and is seen here in florid display celebrating the female virgin. This modern art tapestry "The Virgin" is backed with lining and tunnel for easy hanging. Note: tapestry rod and tassels, where pictured, are not included. Dimensions: W 26" x H 38"